« HOW HAS TECHNOLOGY IMPACTED YOU AS A JEWELRY DESIGNER? It’s my belief that you cannot combine two different media to make a piece of jewelry without letting one of them predominate over the other. Whether combining fiber with beads or metal with beads or paint and sculpture with beads, it is difficult to have a successful, satisfying outcome, without letting one of the media be dominant over the other. Each media has its own set of structural rules and requirements. Each interacts with light and shadow very differently; that is, the materials and techniques associated with a particular media reflect, absorb and refract light differently. These kinds of things make the viewer’s experience and interaction with the media and its resulting products different, from media to media. So, you can have a “knitting” project that incorporates some beads, or a “beading” project that uses a knitting stitch. In the former, knitting would predominate, with more focus on the fibers; in the latter, beading would predominate, with more focus on the beads. 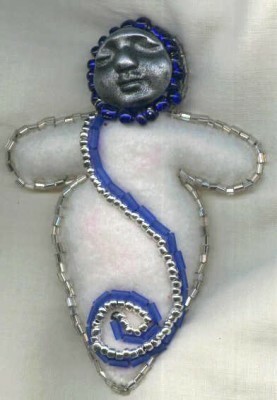 You can have a wire project that incorporates some beads, or a beading project that incorporates some wire elements. But it is rare that you can look at a project, and say it concurrently meets the criteria for success of both media – so, both a successful, satisfying knitting AND beading project, and both a successful wire AND beading project. It is difficult to preserve the integrity of either media if you force them to be co-equals. And you can draw parallels across media to situations crossing materials, as well. It is difficult to mix materials within the same project. For example, it is difficult to mix glass and acrylic beads, or glass and gemstone beads….Unless, you let one material become predominant over the other. But all of this is very challenging, almost off-putting, to the jewelry designer who wants to combine media techniques and materials. How can techniques and materials in other craft and art disciplines be combined with beads to make jewelry? 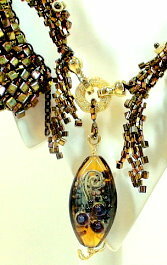 And, how can other art and craft disciplines incorporate beads or traditional beading techniques to make jewelry? What lessons can we learn from attempting to mix media and have two or more media, techniques and materials co-exist in the same piece? 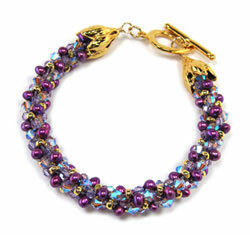 How easily can you combine beads with fibers, without diminishing the integrity of either medium as an art form? What kinds of compromises do we have to make? Does Mixed Media affect our vision of the piece as art? Or craft? 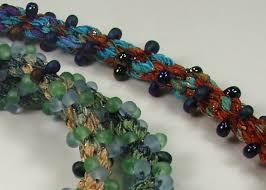 Can you “bead” the same way you “work wire” and in the same way you “manipulate fibers” or “sculpt clay”, and so forth? – all to impact the viewer, their experience and satisfaction with your piece? Or do you have to develop new strategies for coordinating media? Share them by posting them to our group. This entry was posted on September 3, 2013 at 12:17 am	and is filed under Art or Craft?, beadwork, jewelry design. 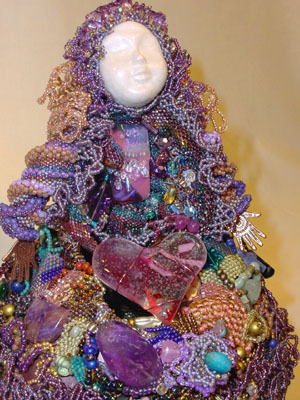 Tagged: beaded art dolls, fiber and beads, fiber arts, kumihimo, metalwork, mixed media art, wirework. You can follow any responses to this entry through the RSS 2.0 feed. You can leave a response, or trackback from your own site.